I was going to save this card for the 4th of July or Flag Day, something super cliché like that. But, I decided I'm much too impatient for that. Maybe call it an early Columbus Day post? The image used for this card is one of my favorite things ever. I had this poster when I was 14, so did my two best friends, well, at least one of them did for sure. Not in a super pervey way but 14 year old me studied every curve of this mega babe. Cindy Crawford in that U.S.A. bikini was my dream girl for sure. I thought she was absolutely perfect. I wasn't alone either. Back around that time -early '90s- Cindy was THE it girl. This is in the design of the the 1988 Topps baseball cards. This is a set that if you've been following this blog this past year you've seen I'm quite fond of. 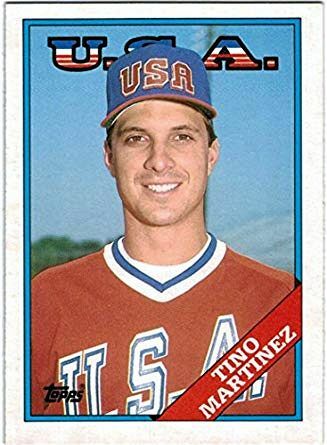 Topps in the their "Traded" update set featured members of the U.S.A. baseball team that competed as a demonstration sport in the 1988 Summer Olympics in Seoul.